Left: Hiking route to Mount Etna summit from south side. 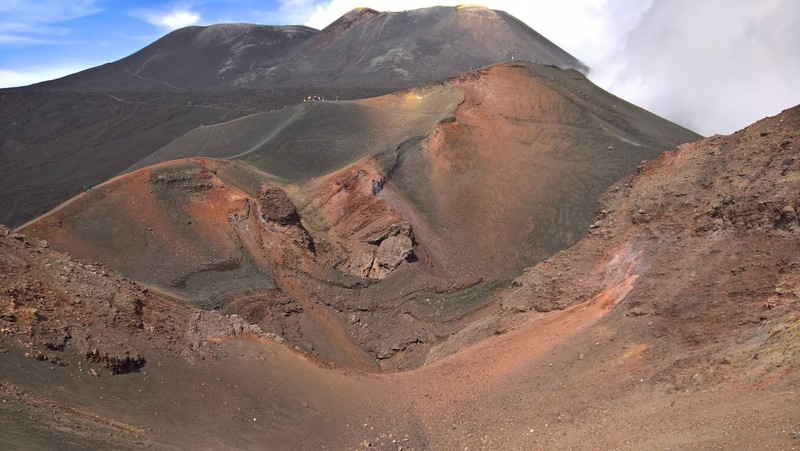 Right: View of main crater of Mount Etna. During Christmas 2001, we were in Taormina, Sicily for a few days. 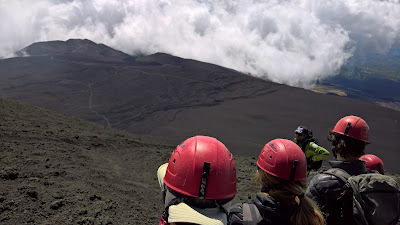 One clear and sunny day, we decided to see if we can get to the top of Etna. Ha, ha, ha – so unprepared we were. 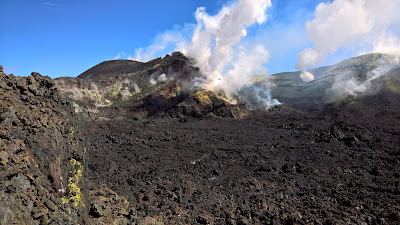 We drove to Piano Provenzana on the north side of Etna and just started walking around. We were nowhere near the summit before cold and wind forced us back down the hill to Taormina. That half-hearted attempt haunted us for 15 years. Well, this year we finally got a chance at redemption. This time around, we prepared and realized that you actually need a guide to go to the summit; you don’t just go up on your own. So on another clear and sunny day – this time in early autumn – we made our way to the Rifugio Sapienza on the south side of Mount Etna. There are different routes and guide services you can use to get to the top. 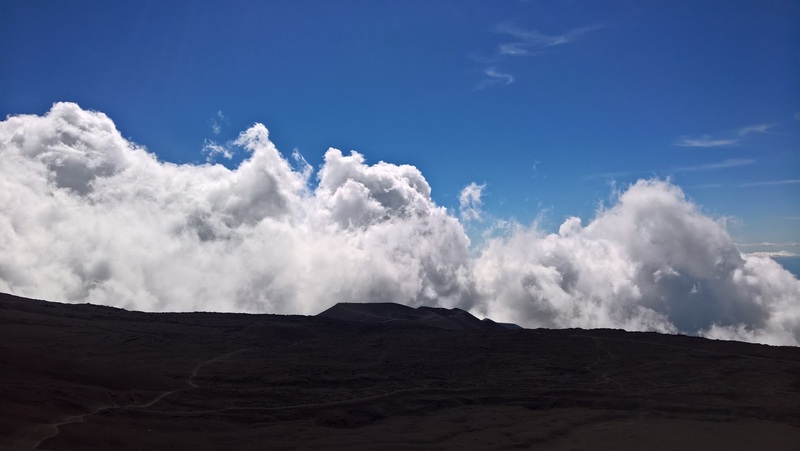 We decided that for us it would be the easiest to join a group at Rifugio Sapienza. 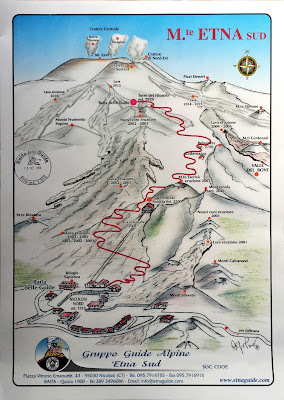 The guide hut where you can join a tour is located next to Rifugio Sapienza and is signed Gruppo Guide Alpine Etna Sud. Aside: If some guy tells you where to park when you reach the rifugio and expects a tip, you can give a little something if you are felling generous, like 1 €. The idea is that he “watches” your car. It’s a scam. He makes a show of putting a blank ticket on your windshield, but it means nothing since parking is free. When we returned from hiking he was nowhere to be found. So much for watching our car. 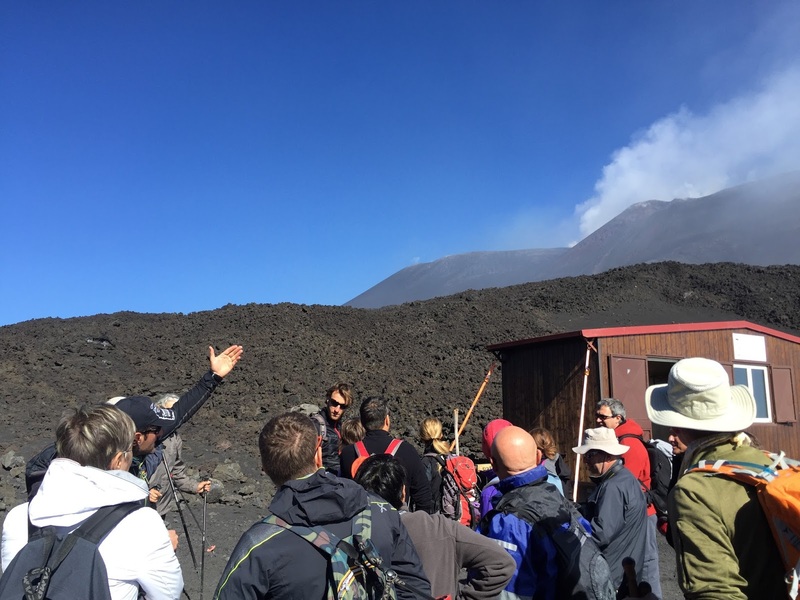 As described on the Gruppo Etna Guide site, there are a couple of tours (escursioni) offered. 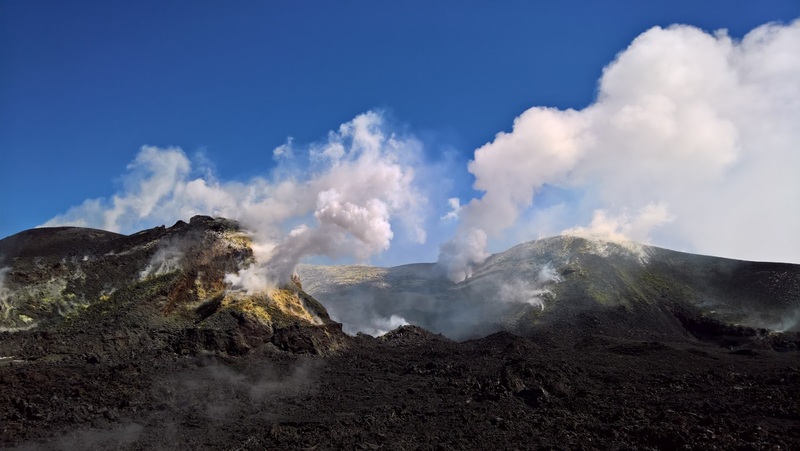 We opted for the crater summit (i crateri sommitali) tour lasting 5-6 hours and requiring trekking abilities of medium to expert. Expert is a bit of stretch: it wasn’t that hard, but you need to be prepared and in reasonable shape with the right gear. Of course, there are many opportunities to buy gear and even borrow it on the spot. For example, from the guide hut you can borrow shoes and jackets and poles. And, as you make your way up there will be purchasing opportunities for hats, gloves, jackets and more. We went on the group tour. We didn’t explore options for a private tour (like we did in Stromboli), so we arrived at the Guide Hut and signed up. It seems like they try to keep the size of the groups reasonable, around 20-25. It’s first come, first served. The earlier you arrive, the sooner you go up. You should definitely arrive before 9:30 am according to the email we received when we asked for information. We arrived around 9:00 am and there was already one group ready to go up. We joined the next group. It cost 85 € a person. 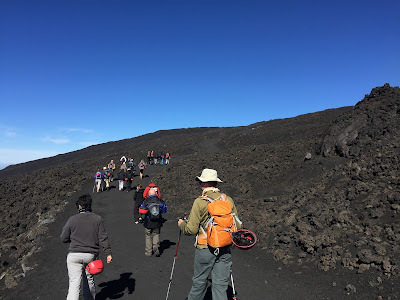 Our guide (Salvo – really good) spoke in English, Italian, and French so explanations came in triplicate. The whole tour lasted about 5.5 hours. Salvo herded our group on to the funivia, and then on to a bus so we stayed together. After the bus, we started the walk. In terms of gear, we brought our normal hiking stuff: boots, poles, several layers. Some folks in our group were wearing low cut, sneaker-type shoes. Some didn’t use hiking poles at all. Just depends on what you are comfortable with. We saw a group of volcanists on a different tour, and a few were wearing pretty serious gas masks. I found the gas at the main crater at one point to be very strong and had a handkerchief over my nose. Not sure if it helped. You could bring a simple respirator or dust mask. Or better yet, you can always descend 10-20 feet to get out the way of the gas. 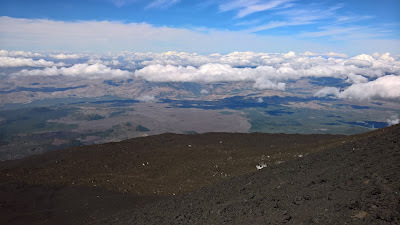 The route to and around the top crater depends on the weather. We had a clear day (40 F and sunny at the top) with winds more or less cooperating so that we could walk along the rim and clearly see all the colors of the crater that our guide said are usually hard to see. At times, we waited for a few moments to cross a section of the rim to avoid gas blowing across our path, and then we dashed across. Aside: I thought it strange that one couple brought a medium sized dog on the hike. The dog was extremely well-behaved but seemed a little out of its element. At times the owners had to carry the dog across gas vents or ground with sulfur deposits. Our guide said that the sharp-edged volcanic rock can be hard on a dog's paws. The funivia and bus ride takes visitors (including our group) to approximately the 3000 m point, which anybody can reach without a guide. From there we passed through a roped off area, and started our climb. Folks not with a guided tour must stay below the 3000 m point, exploring nearby craters and features. Doing it on your own wouldn't be really all that bad either in terms of experience. 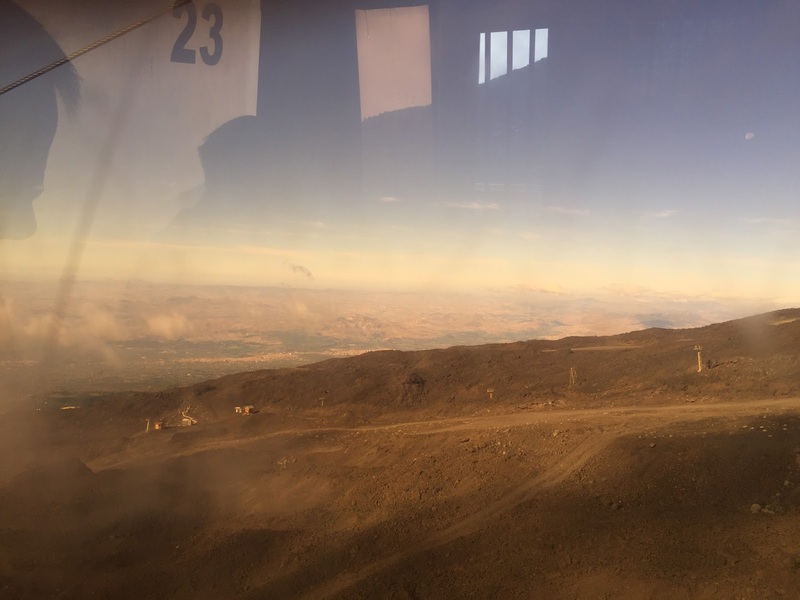 You'd still get great views, just that you couldn't go to the crater. 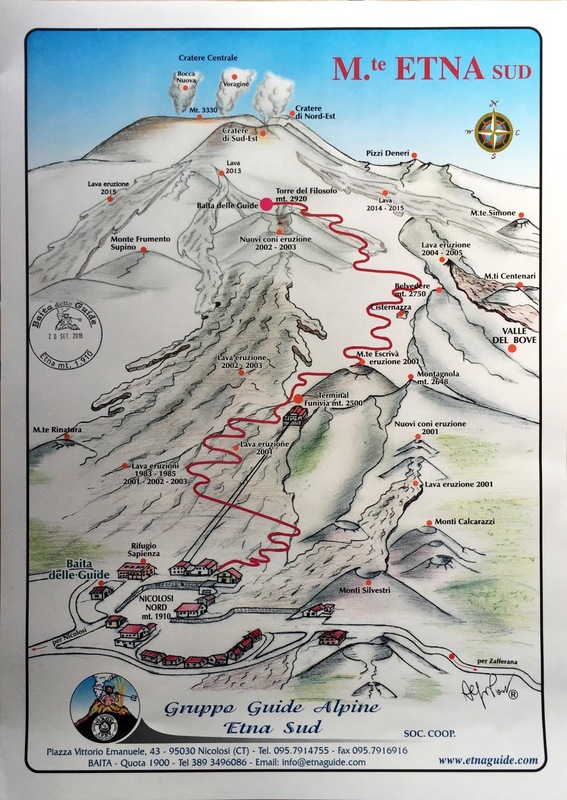 And, if you are feeling like a real workout, you can skip the funivia/bus altogether and walk from Rifugio Sapienza to the 3000 m point. 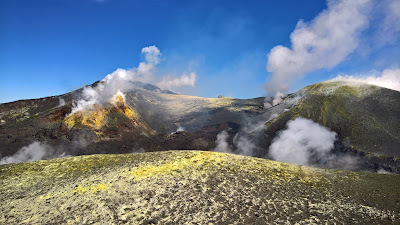 The crater summit hike takes you up to the central crater to see the Bocca Nuova and the Voragine. 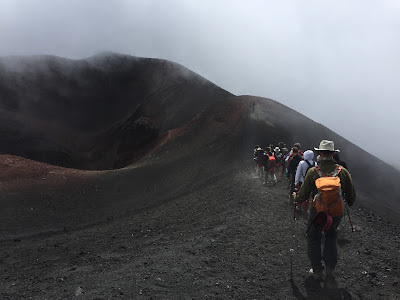 Your hike may be completely different due to conditions or that Etna may reconfigure itself between when this was written and when you visit. Etna has a habit of doing that. 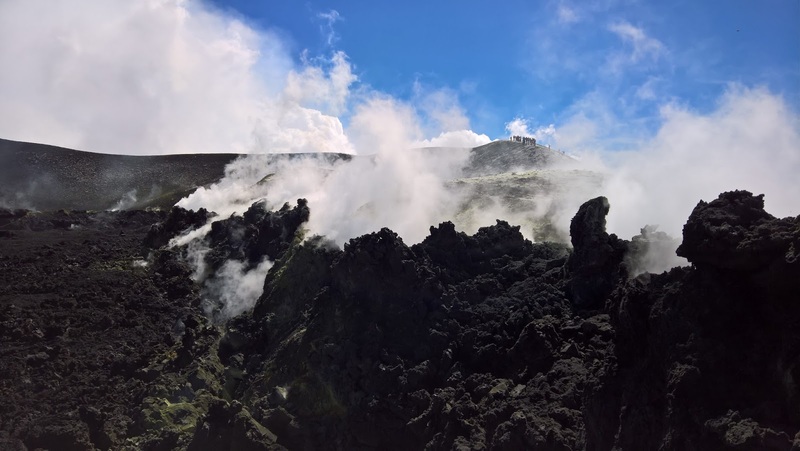 In fact, our hike started on lava from an eruption in December 2015, and during our tour our guide pointed out the many recent changes in the topography in the summit area. We spent 30-45 minutes exploring the crater and then began our descent, continuing past the point where we were dropped off by bus (3000 m) to visit other recent craters below and freely accessible to folks not on our guided tour. The tour ended at the funivia upper station. In other words, we didn't take the bus back down. Along the way down, we paused for a lunch break. It wasn’t clear from the description on the web site that you should bring lunch, but common sense for a trip of 5-6 hours dictates you bring something to eat and drink. 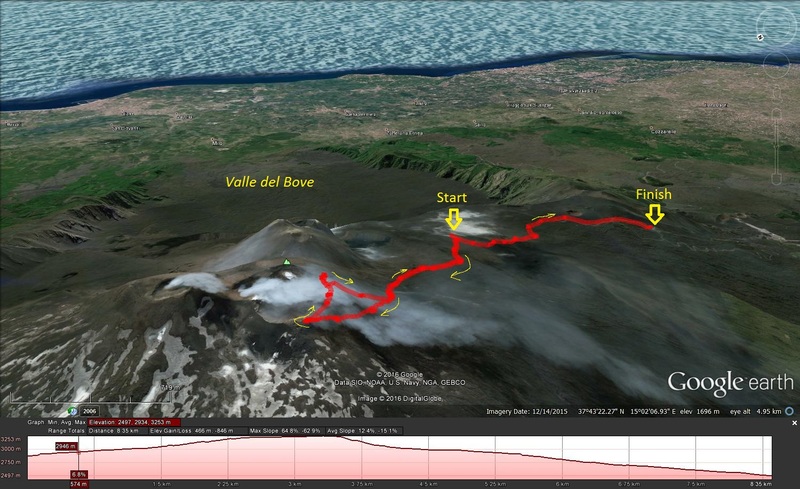 Today’s hike to Etna's crater summit was 8.4 km (5.2 miles) in length, and was short as hikes go. But, what it lacks in length it makes up with stupendous views both of Mount Etna’s constantly-evolving, living landscape and the surrounding views over Sicily. Left: Map showing three Mount Etna hikes we did. 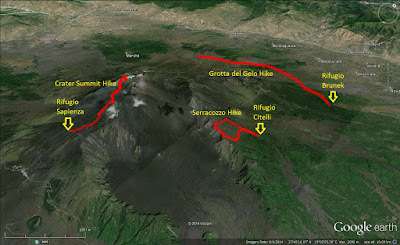 Center: Mount Etna south route - by the Gruppo Guide Alpine Etna Sud. Right: View from funivia (gondola) going up to start the hike. Group shots. Far left: At the start of the hike (after funivia and bus ride). Center left: Start of hike. Center right: Listening attentively to the guide. 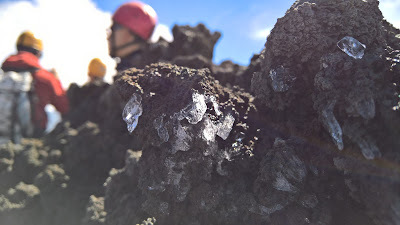 Right: Ice crystals at the crater - when we neared the crater, we put on helmets (provided as part of the tour). Clouds, lava and views from Mount Etna main crater. 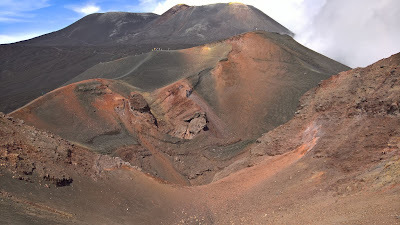 Main crater of Mount Etna, views we saw in the group tour. Left: On the way down, a view back to where we had come from. Right: Making our way down to the funivia top station.